The VF air to water intercooler (charge cooler) was integrated into the tight fitting engine bay as means of reducing charged air induction (boost) temperatures. Lower charge temperatures promote engine safety by reducing knock and improving the quality of the combustion cycle. 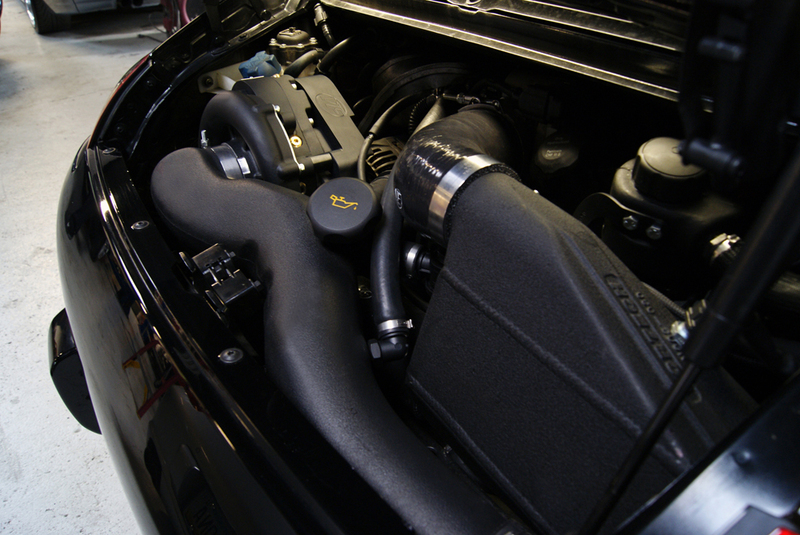 Air charge (boost) from the supercharger is directed through the chargecooler core before entering the throttle body. The cooler core contains isolated channels circulating with water from a separate self contained system cooled by its own radiator. VF-Engineering integrated a Porsche OEM front radiator and front bumper vents into the kit. Water is circulated by means of an added OEM water pump through OEM water lines. Intake air temperatures in the manifold were measured to be approx 140 deg F even with ‘spirited’ driving at 118 deg F ambient temperatures in Arizona desert conditions mid-Summer. This dramatic drop in charge temperature helps the 997 create consistent power. For added safety the chargecooler is designed to perform continuously whilst the ignition is on. Engine management software was by written by VF with extensive testing performed on independent test cars. Multiple factors such as charge air temperatures, ignition timing, fuel trims, maps and injector performance were taken into account. The Carrera 2, 4, GTS, Manual and PDK test vehicles were extensively dynoed on the VF 4WD Mustang and 2WD Dynojet and monitored for wide band air fuel ratios at load levels were often greater than would be experienced on the road. The results are an increase of 150 horsepower and 90 ft.lbs of fully usable torque.